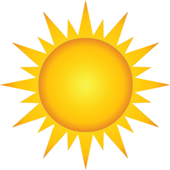 Today: Sunny, with a high near 71° and S-SW wind 5-15 and gusting to 20 mph. Tonight: Mostly clear with a low around 53°. S-SW wind will be around 10 mph. Thursday: Sunny, a high near 78° and S-SW wind 5-10 mph. Overnight, there will be increasing clouds, with a low around 57° and south wind 5-10 mph. The rest of the week: On Friday, it should be partly sunny and very nice with the high up to 76° and south wind 5-15 mph. Saturday Christmas kickoffs and celebrations around Central Texas will enjoy mostly nice weather with a high up to 73° in the afternoon, though it will be windy and difficult for banners and tent as the wind will be westerly at 10-15 mph and gusting to 20 in the afternoon. Saturday evening, the most important part of the day for celebrations, will see clear skies, likely 60s and 50s early and then dropping down to about 48° overnight. It should be fairly pleasant for those wearing coats, and the wind should turn very light for the evening. Sunday will bring sunshine, a high about 72°, and a fairly temperate and typical November day.